The loops are approximate so it is recommended that you do a test before you cut the ribbon. 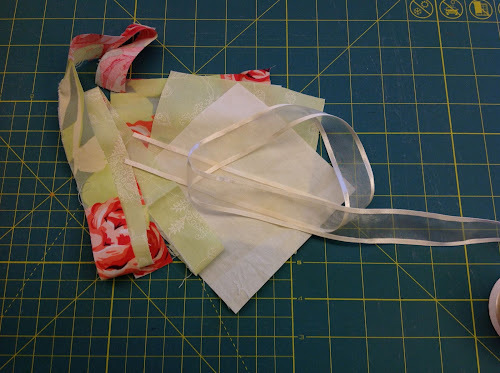 Get the cream 5 inch square and the end of the ribbon roll and place it at at least 1/4 from the left edge of the square. Hold the ribbon in place while you fold it up. Remove the pin and pin the fold. Now fold the ribbon back down, remove the pin and repin on this spot. And finally fold the ribbon back up again making sure the previous fold and the fold on top overlap. Pin the fold there. This is the fold you need to pin at every stage. Repeat as many times as folds you make. I made 5 but you could have more or fewer, depending on the size of each fold. The trick is that both folds overlap because we will be stitching the ribbon on that overlap. I did move the pin heads to the other side (see the picture) to get them out of the way when I placed the second ribbon. Leave 1/4 inch on each side of the square. 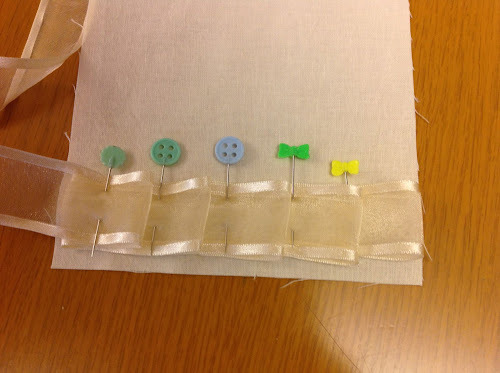 Adjust the gap between ribbons in order to cover the square surface as much as possible. Once you’re happy with the loops, stitch along the overlapping folds. Stitch both strips of fabric together. Press open to reduce bulk. Now cut the strip in 4 pieces, 5 in long each. And two more 1 inch long piece. Place as it will be stitched making sure the pale green side is placed against the floral squares and the floral strip side against the green square. Make sure you alternate the 1 inch pieces that go in the middle as per picture. Piece the long middle piece as per picture. Now stitch as per picture above and voila!